With The Bahamas 16 weddings promotional campaign less than a month away, The Bahamas is finalizing plans to ensure the multiple weddings are a success. 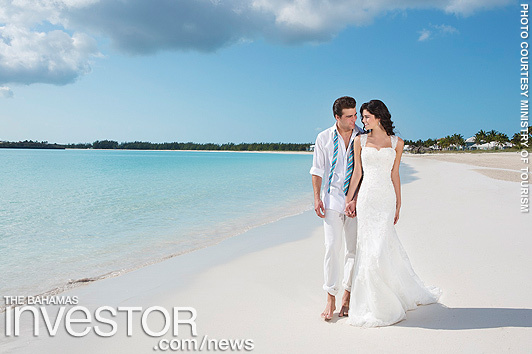 With The Bahamas 16 weddings less than a month away, The Islands of The Bahamas are finalizing plans to ensure the multiple weddings in paradise are as timeless and perfect as the 16 lucky couples imagined. However, due to the impact of Hurricane Matthew, the weddings once scheduled for Grand Bahama Island will now take place on Nassau and Paradise Island. Couples will be updated as soon as possible so that the relocation will be a smooth transition. The excitement continues to grow among the Canadian couples who have been dreaming of their destination weddings for months. The 16 Canadian couples will be a part of sixteen weddings in various locations throughout The Bahamas all transpiring simultaneously on November 16. The weddings will take place on the beautiful islands of Abaco, Andros, Bimini, Cat Island, Eleuthera, Exuma, Harbour Island, Long Island, Nassau and Paradise Island. Sr. Manager of Romantic Travel, Weddings, and Honeymoons at the Ministry of Tourism Vinincia Strachan said The Bahamas is keenly awaiting the chance to share its country with the world. “There are a few places in the world as beautiful and romantic as The Islands of The Bahamas. With the celebration of our 16 weddings event, we hope to share the wonder of our country. We look forward to welcoming the couples and their guests on November 13 for the welcome reception at Atlantis,” Strachan said. Each couple will receive round-trip airfare to The Bahamas, hotel accommodations, meals, a wedding ceremony, cake, flowers, champagne, rehearsal dinner, a small reception, a videographer and a personal wedding coordinator to assist with planning their wedding. Andros is holding a wedding reception and ceremony for an American couple and their 160 guests this week, the first such event since the Family Island was battered by Hurricane Matthew the week before last.